Fox is wasting now time sharing content from the feature adaptation-in-progress for James Dashner's The Maze Runner. 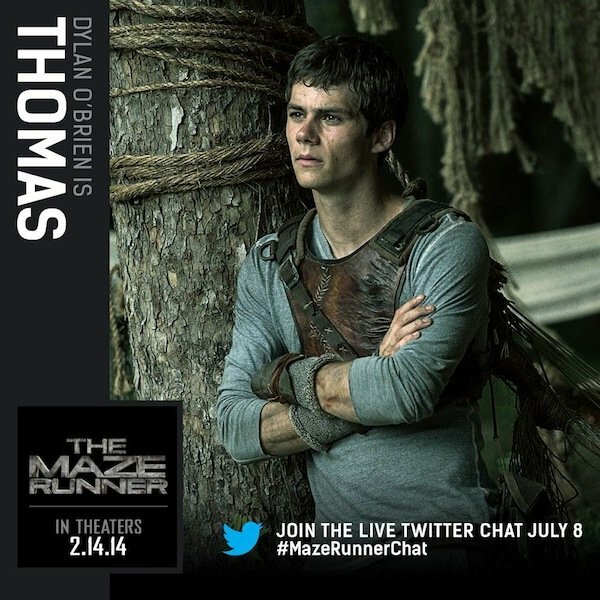 Earlier this week, we got our first glimpse of some stills from the movie, and in anticipation of an upcoming Twitter chat, we're starting to see some great character cards, which give us an up-close look at some of the characters, including the story's protagonist Thomas, as seen above, portrayed by Teen Wolf's Dylan O'Brien. The benefit of adapting a book to screen is the built-in fan base, and studios seem to be making good use of that in their efforts to promote upcoming features. The Maze Runner is no exception. The first book in Dashner's series introduces us to Thomas, a teen who wakes up in a dark elevator that delivers him to a place called the Glade, which is inhabited by other teen boys who arrived just like he did over the past couple of years, each showing up with no memory of how they got there or who they are, beyond knowing their own name. Every day, the walls of the Glade open up to a huge and dangerous maze. The bravest and fastest of these kids run into the maze each day in search of a way out. At the end of the day, they do their best to get back to the Glade before the walls close, lest they suffer the fate of being stuck in the maze overnight, as it's unlikely they'll survive until morning. The next character card shows us Jacob Latmore as Jeff. In the book, each of the kids in the Glade is assigned to some responsibility, whether it's running through the Maze or serving some purpose in the Glade. 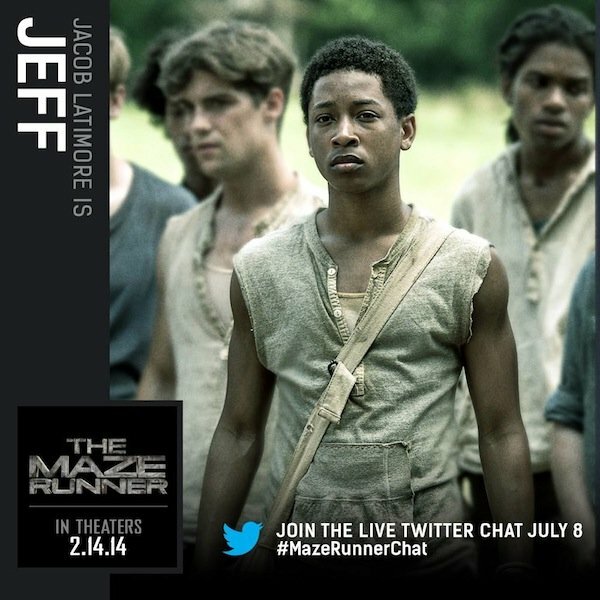 Jeff is a Med-Jack, which means he handles medical emergencies, and given that these kids are left to their own devices and kids tend to get hurt and even attacked by dangerous creatures in the Maze, emergencies tend to arise from time to time. Maybe it's the clothes. Maybe it's the pose. Either way, I'm picking up a big Peter Pan vibe on this one, which is giving this story a Lost Boys tint to go with its seeming Lord of the Flies nod. 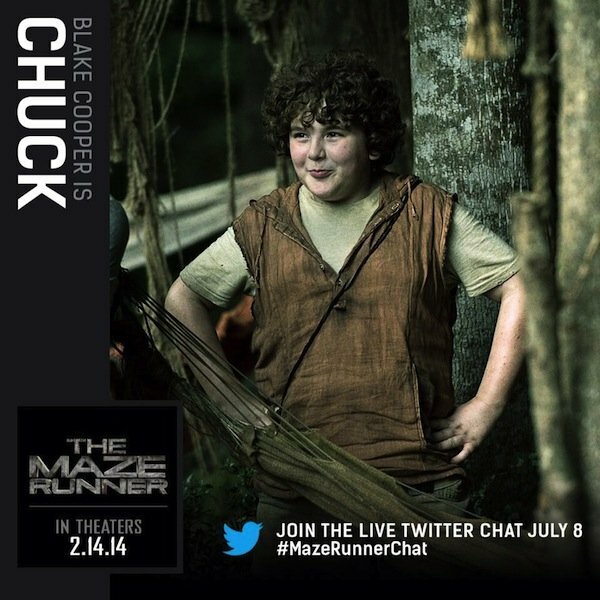 In the book, Chuck's the youngest of the kids in the Glades, and he takes an instant liking to Thomas, and helps him learn the ropes. You might notice that he doesn't look like the friendliest of guys. 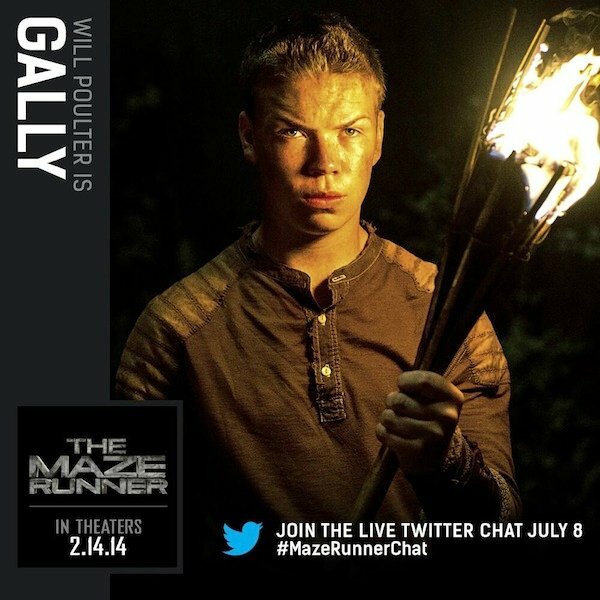 To put it mildly, Gally doesn't hit it off with Thomas nearly as well as Chuck. In fact, Gally distrusts Thomas right off the bat. There are other characters who have yet to be featured on a card, including Minho, Alby and Teresa, the lone female among the group. But considering these images are all promoting the Live Twitter Chat set for July 8, there's still time for those images to be released. A good way to keep up with them is to Like the film's Facebook Page or follow the movie's official Twitter. The Maze Runner arrives in theaters February 14, 2014.